The Englishman John Harwood enriched the horology with an invention, which in the meantime is indispensable for the modern valuable watch: The automatic winding was initiated by the “HARWOOD perpetual”. 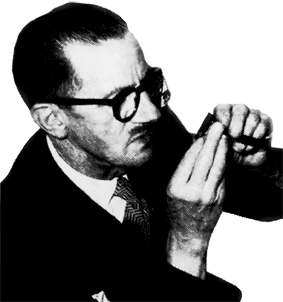 Already 1924 John Harwood’s invention was patented and two years later the first "Harwood perpetual" saw the light of day on the occasion of the Basel fair. Up to then the winding of wrist-watches was only manually possible by winding the crown. 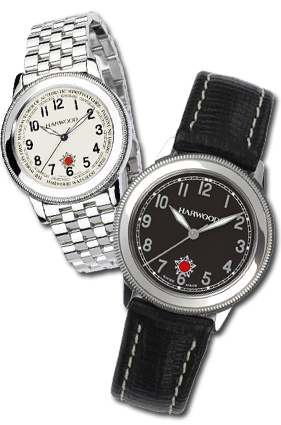 The invention of Harwood however used the kinetic energy at the wrist of the wearer for tightening the mainspring by means of an oscillating rotor in the center of the watch movement, a ’perpetuum mobile’ for an omnipresent timepiece. This ingenious invention ranks among the milestones of watch history and acquires the title of a classic among wrist-watches. The watch without a crown, with a fluted bezel and singular hand setting mechanism is a rare watchmaking piece. The traditional crown function is managed by the bi-directional adjustable turning bezel, which can likewise be used for hand setting and manual winding. A coloured dot indicates the respective mode of the watch showing up in a round dial window on the 6 o'clock position. HARWOOD - A leading model with technical sophistication, exciting style, innovative, functional and dignified manufactured. A historical milestone having a secure place in the Olymp of the classics.